The deluge of data from streaming UHDTV video, the Internet-of-Things (IoT) and especially cloud services has finally created a need for circuit board-level optical interconnects as well as for optical backplanes. In the future, the author believes that other novel services – such as those related to virtual reality and telepresence – will put even more pressure on data communications and telecommunications box makers to extend the use optics in the “guts” of their products. 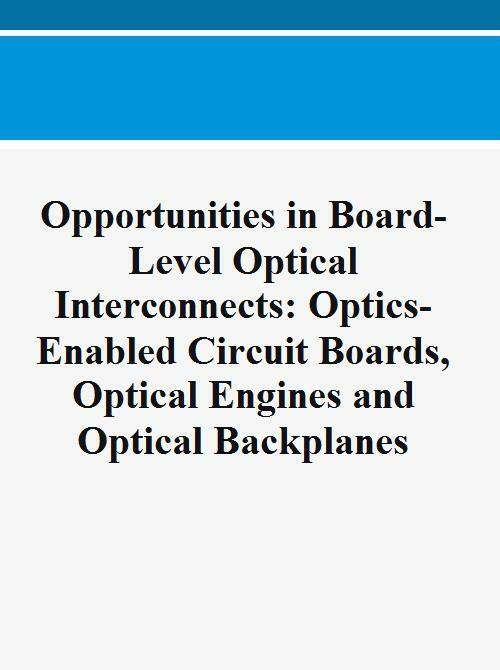 This report is designed to identify new opportunities for board-level optical interconnects and optical circuit boards. This is an area where the author has provided coverage for many years and the forecasts and other data provided in this report are rooted in an insider experience of this interesting area. Thus, this report contains a technical analysis of the requirements of this space (issues such as power consumption, etc.) and a detailed ten-year (volume and value) forecast with breakouts by type of box (HPC, servers, routers, switches, telecom equipment, etc. ), components, fiber, etc. The report also offers an assessment of the product/market strategies of key optical firms active in this area. When the author first began coverage of board-to-board optical interconnects, such items were mostly cobbled together in small numbers by HPC firms such as IBM. However, what CIR is seeing now is a wave of commercialization brought on by the growing need for board-level optics in the data center. For the past few years, much that is interesting in this area from a business perspective has been related to optical engines, with many of the largest firms in the optical components business building a interconnect product arrange around a core engine technology. Also of growing importance in this area is the optical backplane area, which is also undergoing an area of intense commercialization. This report provides an analysis of such activities from the perspective of revenue generation and discusses how firms active in the optical interconnect space can distinguish themselves in the market through both technology and supply chain strategies. The author is particularly interested in this report as to how the latest in optical integration/silicon photonics can benefit the optical interconnect space. The author also examines the opportunities that are presented by the high-speed electronic ICs that will be needed to support the growth of board-level optics. In addition, the report provides a critical analysis of the standards and MSA work that is being done in this space. 3.1 High-performance Copper interconnects: End of the Road? 3.2 The Role of Optical Integration in the Rise of Optical Interconnects.